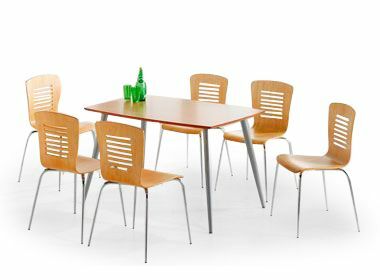 Designer bistro set comprised of six high quality chairs with decorative backs and anti-slip feet. The table is very durable with a stained Maple veneer and steel legs. A collection of six bistro chairs and table make up this bistro set. The rectangular café table consists of a rectangular top consisting of a maple veneered MDF core. The designer metal legs of the café table are of tapered design. Six matching Baroj cafe chairs make up this bistro set. Baroj bistro sets are delivered in a flat packed condition and are easily assembled. The normal lerad time for these bistro sets is 2-3 days from order. 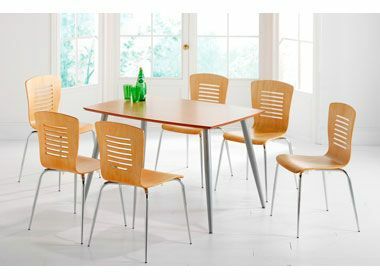 Barof café chairs have a slatted back design and are suitable for home and commercial use.